The mission of the Partnership to Ban Horse Carriages Worldwide is to effectively organize and work with multiple organizations around the world to streamline our identical purpose of banning the dangerous, cruel and unnecessary practice of horse drawn carriages. With our Partnership Pledge, we have received numerous endorsements from businesses in the community. This community support is so important to our movement. Community Support from Businesses is Key! Not only does it show that we have broad support but it puts local governments on notice — not only are individual members of the community behind this movement, but so is the business community. 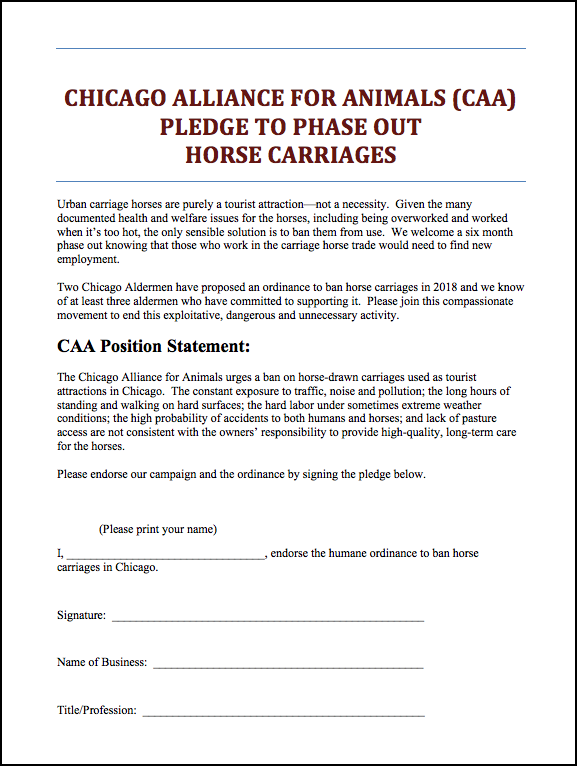 When a business endorses a horse carriage ban in Chicago, they support a ban everywhere. Consider adding your business’ voice to the ban. Want to have your voice heard right away? Download the Partnership Pledge right here and email us the form when it is complete! You can view the actual endorsements on Facebook.